Who do I contact about counselling in the LEX? Where is Careers Advice & Guidance? What LGBT events are there next month? Looking for part-time work as a hairdresser or makeup artist? Today is World Poetry Day! Posted in Announcements on the 6th of December 2018. 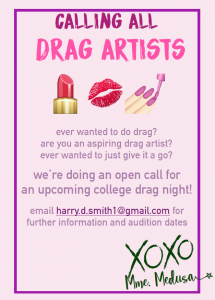 Open Call for upcoming drag night! There are no comments yet, why not leave one below? If you want to leave a comment then you need to log in first.